Version 09 begins this Thursday April 23rd. Ed Marszewski took some time out of his busy schedule to answer some questions and let us know what’s going on over in Bridgeport. So, Version was originally at the MCA and Buddy gallery? Now that you have been based in the Co-Prosperity Sphere how has Version grown? It started in 2002 at the MCA and was three days long. Over just a few years it spread throughout the entire city and was held everywhere from the Cultural Center, SAIC, MCA UIC, to contemporary art spaces alternative and trashy. It didn’t get to buddy until the third Version where we started hosting events all over. It once lasted 17 days and we used to boast that this is how we would like to live every day. Version is really five or six festivals combined into one ten day freak out. We have internationally curated video programs, our own version of an art fair featuring artist run spaces and groups, a great performance art program, incredible music, and works by over 350 artists displayed in our venues. This year we have artists hailing from Turkey, Germany, The Netherlands and of course many from our own back yard. We like to concentrate our programming to reveal the diversity of tactics strategies and platforms used by cultural workers to expand our networks, distribute ideas, and show how incredible it is to live in this city. The festival is a completely open platform and each year it is created by a different cast of characters. Our role is to facilitate an realize what we think are some of the most exciting projects in the country. This make the festival very flexible and ensures that it will be a fresh (to us) experience each year. We are not stuck doing the same programming year after year and are able to initiate new platforms or initiatives at any time. This year Version is going local and the festival is mostly taking place on the southside in Bridgeport and Hyde Park. We are hosting shows and exhibitions, live art, music, and some incredible projects at the ZHou B Center, Co-Prosperity Sphere, neighborhood galleries and a 100 year old community center and gymnasium called the Benton House. 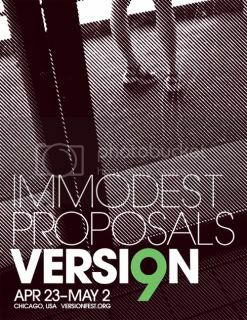 Could you talk a little bit about this years theme “Immodest Proposals”? Each year we have an open ended theme to see what happens with the submissions. This year we were into the idea of artists suggesting outlandish ideas that would probably not be realized. Fortunately for us many of them will be realized and initiated at this year’s festival. What is the Bridgeport WPA? 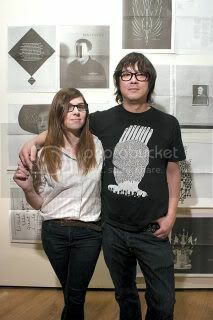 a dIY art fair should be. May 2 : The first annual Chicago Art Parade. Bring your bunny costume. For more information on Version 09 please check out their site. thanks so much for posting this Meg! The first five people to mention they saw this interview blurb can have a free copy of our new issue of Proximity! Sounds good. My friend is doing an installation about rats and blood, “to fit the theme” of the portion she’s in.